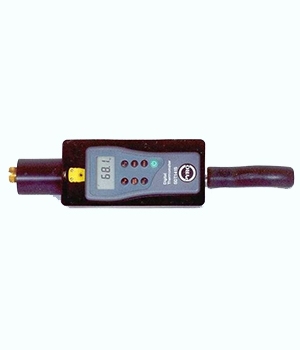 The Pyrometer Digital 250-Contact digital thermometer is a rugged portable easy to read thermocouple pyrometer that utilizes interchangeable, reusable thermocouple tips on contact temperature measurement applications. These digital thermometer pyrometers are ideal for temperature sensor measurement using thermocouple thermometer K type thermocouples. Instrument temperature display accuracy to ± 0.3% of reading. 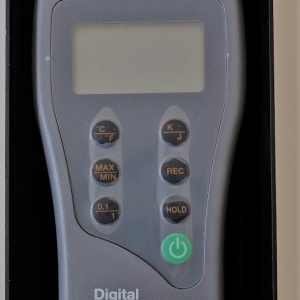 The Digital 250 digital thermometer meter comes complete in a durable aluminum housing and is ready to use with a wide variety of thermocouples. The extension arm is constructed of 5/8″ chrome plated Brass Tubing. 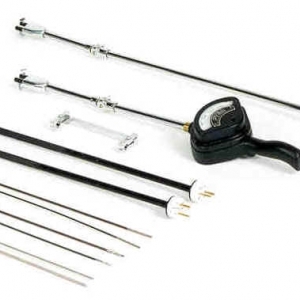 There are two versions of extension arms to choose from, either a direct connected 12″ long rigid arm or if you are taking temperature measurements in an awkward or hard to reach position, there is a flexible extension arm with a 12″ rigid arm that includes a bicycle grip type handle connected to 30″ stainless steel interconnecting armor cable to your Digital 250 for taking high temperature measurements in any position at a safe and comfortable distance. The PYRO Digital 250-Contact digital thermometer can accommodate a wide variety of thermocouple tips that are suited for many types industrial and commercial applications.